Cary Savage (center), director of Nebraska's Center for Brain, Biology and Behavior, listens to a question from Eric Olson of the Associated Press. With cameras recording and plush emerald-green turf mere feet away, the skipper stood at the podium, overlooking the assembled media, praising four superstars seated behind him. They helped make 2018 a record-setting year for Nebraska, he said, racking up wins while leading their respective teams through an increasingly competitive conference. “Husker athletics is a great source of pride for Nebraskans,” he said from the heart of Memorial Stadium. That pride helps drive the traditional media days on which the University of Nebraska–Lincoln modeled its April 8 event. And those media days inspired the university to select the Nebraska Athletic Performance Laboratory as the site of this one. But Bob Wilhelm, vice chancellor for research and economic development, was there to talk about achievements in a variety of fields, not on them: early childhood and ecological resilience and concussion research, not football or baseball or soccer. 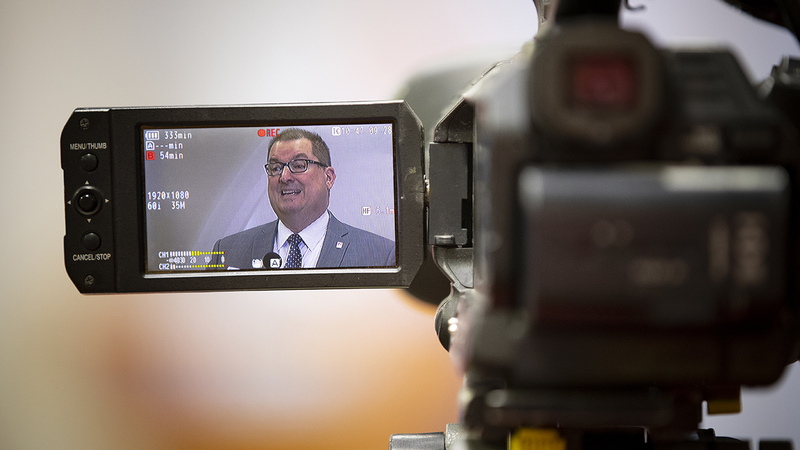 Wilhelm then introduced the stars of the university’s inaugural Research Media Day. True to the template’s form, Susan Sheridan, Craig Allen, Cary Savage and Christopher Bach proceeded to speak on their teams’ game plans, challenges and victories before taking questions from the media. Bob Wilhelm, vice chancellor for research and economic development, addresses the crowd at Research Media Day. One of Allen’s colleagues, Dirac Twidwell, is researching how a concept familiar to Husker football fans — encroachment — has fueled the threat of wildfires in the Cornhusker State. As the fire-sensitive eastern red cedar has encroached farther into Nebraska’s prairies, the tree has introduced a greater risk of uncontrolled burns like those recently befalling California. Those wildfires have prompted the public to seek out more information about their contributing factors, Twidwell said. Yet tethering research to a time-tested tradition of athletics, he said, also represents a strategic way to generate interest in issues that the public might not otherwise know much about. “Oftentimes, it’s hard to start a discussion about the things that we don’t know we don’t know as a society,” said Twidwell, associate professor of agronomy and horticulture. “There are some issues here — when you’re talking about sports or concussions or the brain — that people readily connect with because they’re so high-profile. As a prominent researcher on early childhood, Sheridan shares Twidwell’s interest in the cumulative, long-term implications of seemingly small environmental changes. The challenge of an event like Research Media Day, she said, lies mostly in condensing decades of research findings on those effects into takeaways dispensed a few minutes at a time. 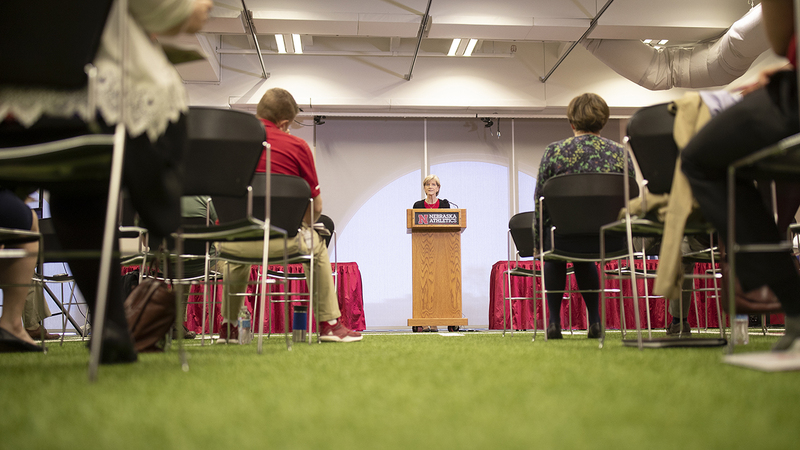 Susan Sheridan speaks at Nebraska's Research Media Day on April 8. For the director of the Nebraska Center for Research on Children, Youth, Families and Schools, that meant focusing on a couple of main points: Early childhood matters more than most know, and so do the factors that shape it. The center’s intervention projects, which often involve communicating its research with teachers, parents and other caregivers, have helped hone Sheridan’s ability to home in on the essentials. “What happens in a child’s life from birth to age 8 actually predicts pretty much everything that we can expect to see in a child as they grow, learn and develop over the years to come,” Sheridan said. “And as part of that, all the adults in that child’s life set the stage for the kind of future that child will have. Putting data into practice — football or otherwise — has become a hallmark of the Nebraska Athletic Performance Laboratory, the first in-house sports science facility in collegiate athletics. That forward-thinking mentality echoes some of the pioneering weight training and nutrition that previously helped Nebraska athletics rise to such lofty heights, said Bach, who took over as the lab’s permanent director in 2018. The trappings of that innovation — an 18-camera motion-analysis system, force plates embedded in running lanes — surrounded the afternoon’s proceedings. Though the football program is a beneficiary of that data, it also acts as a benefactor to the Center for Brain, Biology and Behavior. Its director, Savage, said CB3 is unique in conducting annual baseline and post-concussion MRIs on every football player. Post-concussion scans go to the University of Nebraska Medical Center for analysis and clearance before a player returns to the field, Savage said. But that data also informs CB3’s search for the neurological and physiological signatures of concussions, which could help clarify their long-term repercussions and ensure that athletes have recovered as fully as possible before returning to action.